February 9, 2008 : Sunny and Pleasant, Water Temps 46* to 51* and clear. Caught bait early this morning and picked clients up at High Point at 7am. Headed downlake and checked a few areas on the way and set out 9 Planner Boards, a bobber and a downline over a 15 to 2o foot flat. A buzzard followed me from the marina and set down also about 100 yards behind me and once I started putting out my spread he fired his motor up and went around us and set back down 50 yards in front of us. I guess he thought if he got in front of us he could catch all the fish. 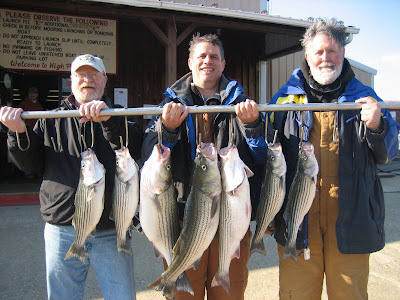 Anyway, after we moved away from where he spooked the fish two of the boards that were running the shallowest got hit and Bob and Steve grabed the rods. It took a little teamwork to get both the fish in the boat, both got tangled with other lines but we managed to untangle them and net the fish. Happened to be the two largest fish of the day. We pulled the area for 2 hours getting several hits and boating a bunch of fish. At 9:30 we moved and set up on some fish in 50' of water near the bottom . We put downlines in their faces and put a few more in the boat. By 10am the wind was getting up and we decided to move uplake and set up on a 24' flat with downlines and caught a couple before I moved even further uplake and set up on some 25 to 30 foot flats. I put out 7 boards, a bobber and 6 downlines and we worked the area for a couple of hours boating a few more. 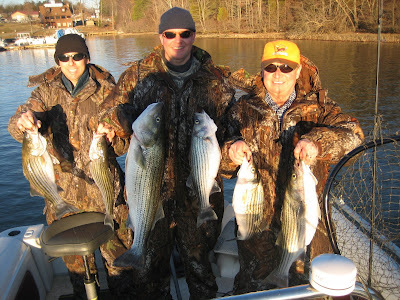 Today we had 23 Strikes, boating 12 Stripers and clients releasing all but a few to take home for diner. 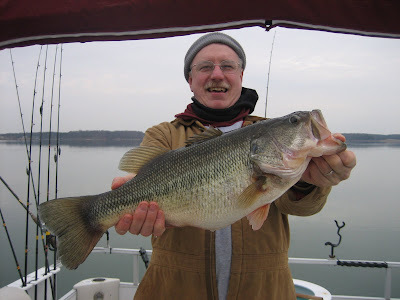 The 3 largest fish were all around 10 pounds. Feb. 2nd, 2008 : Sunny and Pleasant, Water Temp 44* to 49* and Clear. Picked clients up at 7am and set up on a 15 to 20 foot flat. Rigged 8 Planner boards , a bobber and a downline and got hit immediatly . 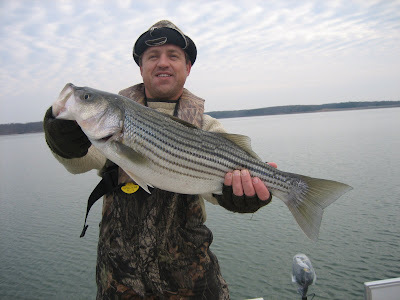 Kevin jumped on the rod and wrestled in a 33" Striper for the first fish of the day. 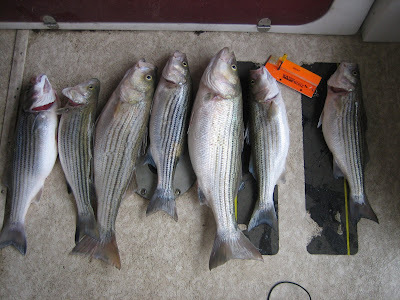 We pulled about 200 yards and turned around to make another run over the same area and a friend [Striperholic] called me and said he had already limited out and come help him with a school of fish. Well it was only 7:30 and for him to already have caught his limit and we having caught the big fish and getting 2 more hits without hooking up I made the decision to run to the numbers. We got the rods in and within 5 minutes we set down beside Striperholic. He was on a 50 foot flat and had seen fish close to the bottom so I instructed the guys how to put downlines out and baited up 8 rods. No sooner did we get baited up did the fish start hitting. It was a little chaotic for awhile until the guys got it together but we caught a few there before the school moved. By 9am the fish had turned off and we looked for more schools finding only scattered fish in 40 to 50 foot depths. I fished them and pulled boards over some more flats but the Bluebird skies and boat traffic turned the fish off. 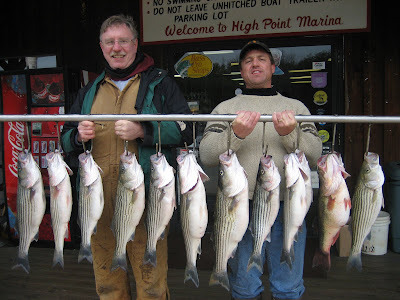 We ended up having 23 strikes boating 14 Stripers and the crew taking a couple home for dinner. I kept overhearing all of them saying throughout the day " If only Matt were here ......."